The day is still young, and I've already chased down a man like a crazy person. In the parking lot of Taco Deli, I saw a guy walking a dog that from a distance looked a LOT like Tuesday. Same size, same build, same dopey, tongue-lolling grin. I haven't seen any dogs that looked that much like Tuesday ever, so I was insanely curious. I texted Kaci and told her. And then I thought to myself "I bet I could still find them." So I started the car, took off down the street, parked in an apartment complex, and walked up the sidewalk. I stopped the guy, asked to take a picture of his dog and chatted briefly. The dog was a lot shyer than Tuesday. I mean, Tuesday can be skiddish in those situations, too, but this dog was a little freaked out. I was being crazy, so maybe the dog was right. Anyhow, dog facts. 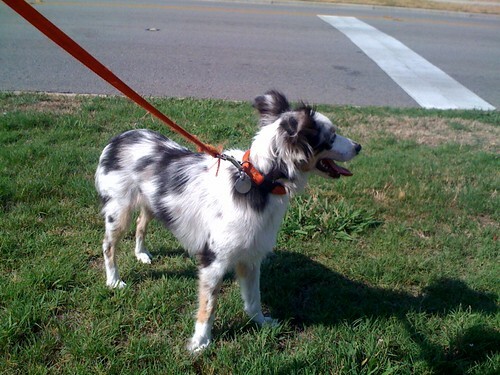 The dog, a girl, is a mini aussie from Kyle, TX, and is only 9 months old. Appearance-wise, she obviously has shorter fur than Tuesday, but I think that's just hte adolescent thing, and she'll fluff out soon. She's also a little smaller. I think she'll definitely get bigger and fill out more, but I think she actually is a little smaller than Tuesday in general. Her snout is also a little different. And that's my crazy dog story. I'm marrying a crazy dog person! I think I started it though, by begging for a pup. Tuesday has changed our lives! At least, in the way our lives relate to dogs. There's an adorable dog around the corner that I've nicknamed Wednesday because it looks like your pup. Maybe I'll take a picture next time I pass by. ...which begs the question, what was pseudo tuesday's actual name?